Our team of artificial grass experts carefully research and select the best turf products the market has to offer and present our clients with only the highest quality synthetic grass. We spend countless hours examining every detail of each hand selected product including: blade shape, length, thatch, color, texture, backing, coating, warranty, durability, and stitching. Our products come from different manufacturers around the U.S. including Synthetic Grass Warehouse, Synthetic Grass Superstore, Purchase Green, Challenger Industries, Tiger Turf, and Field Turf. Our mission is to educate our clients on the artificial grass products available that best suits their needs. Whether you are a pet owner, commercial business owner, or a home owner looking for a low maintenance, eco friendly alternative, we have a product for you. 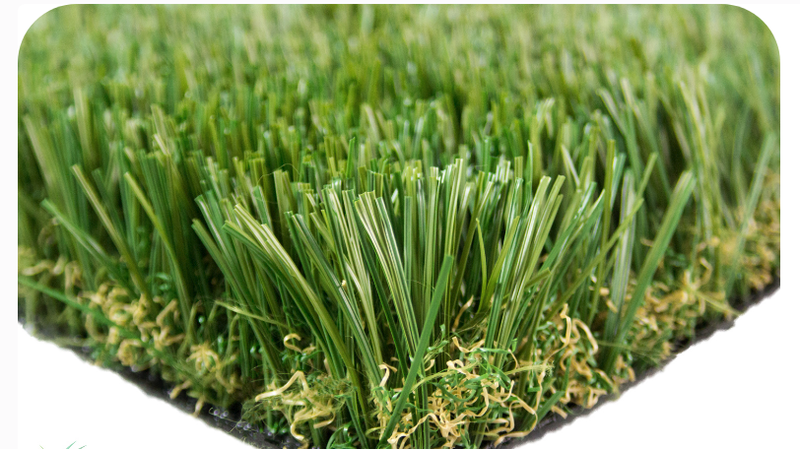 Ecograss offers two different types of artificial grass backing products: Poly propylene (green backing) and Poly-urethane (black backing). 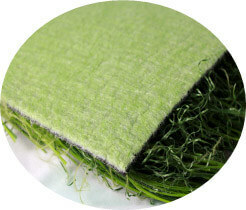 The poly propylene is a green fiber backing that allows water to go through the entire product. The black poly urethane drains through the wholes that are punctured every 6 inches. Durability and longevity on both products are the same. - Length: 1.75" - 2.25"
Ecograss, if within 10 years of the completion of the work, the workmanship of the installation fails to conform to our installation quality specifications, Ecograss will, at its election, repair or replace the turf at its own expense. This warranty assumes normal and reasonable use of products. This warranty does not cover any damage caused by occurrences beyond the control of Ecograss, including, but not limited to, overloading, impact, abrasion, commercial use, improper or insufficient maintenance, corrosion due to atmospheric contamination, poor soil, tree roots, changes in the water table, water main breaks, rips or tears in turf, burning or melting of turf (including from direct sunlight or reflections of sunlight), surface temperature of turf, or hard water deposits or other water marks on turf, mottling of pool plaster, scratching or scuffing of pavers, lack of traction on or slipperiness of joint sand stabilizers, or efflorescence in pavers and stonework. This warranty does not cover any damage caused by insects or animals, including, but not necessarily limited to, burrowing underneath surfaces and/or chewing through turf. Tampering with any products by other than Ecograss voids this warranty.